Enhance Your School Music Program with a Chime Grant from Area 5. Click here to apply. Area 5 owns 10 sets of handchimes that are loaned to qualified school programs throughout the five-state area. Teachers may apply at any time. Grant recipients receive a three-octave set of handchimes as well as teaching materials, maintenance manuals, and music. The Handchime Grant Program was established in Area 5 of the Handbell Musicians of America to promote handbell and handchime ringing in an educational setting. There are unique learning opportunities to be found when using handchimes. Handchimes can be used to teach a variety of musical concepts in the general music curriculum as well as being a fun and challenging ensemble instrument. In addition, they can be used to meet several of the National Standards in the area of playing instruments, note reading and improvisation. Area 5 is committed to supporting the inclusion of handchimes in the general music classroom. There is no better learning experience for students than combining singing, playing chimes, and adding Orff or other percussion instruments to produce a total, all inclusive musical moment. 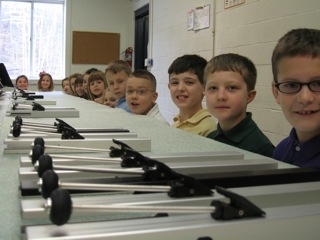 These same instruments can then be used to create a handchime ensemble which will teach ringers concepts of music, teamwork, mental focus, and the joy of personal achievement. This one instrument can add so much to the music classroom, we want everyone to have the opportunity to experience the fun and learning that handchimes offer. We are pleased to share some of our success stories with you. We will continue to add new stories and let everyone see just what can happen with a set of handchimes and a group of eager students. Just left my FIRST grade music class after having played a passable hand chime version of Happy Birthday! Am currently using them in grades 1, 2, 3 – having good time learning some basic music theory and chime technique. After receiving the refurbished chimes I started a Chime Club at my middle school. I had eleven 6th and 7th graders ring each Friday afternoon in my classroom. The Club ended up trying out for the Talent Show last May and actually made the final cut. Eight of the girls dressed up in baseball uniforms and played “Take Me Out To the Ballgame” as an audience sing-a-long. The students loved it and the teachers thought the group was fantastic! Thank you so much for the wonderful opportunity to use these handchimes for the school year at Reid Primary and Middle School. The students learned a great deal, and enjoyed using them in many ways. 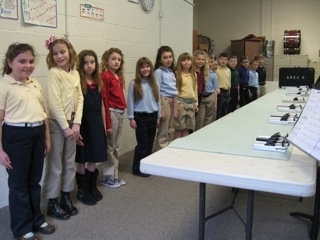 Our biggest project with the handchimes was the creation of a Sixth Grade Handchime choir. It was made up of twenty students that were already enrolled in Sixth Grade Choir, and they rehearsed for one period each week. They learned a great deal throughout the year, and performed for the School Board Meeting in November, and also in both the December and May choir concerts at Reid. These students loved being part of the group and are looking forward to continuing to play handchimes in the future. I learned how to read music. I liked the sound that the chimes made. It was hard learning how to read music. I didn’t know about chimes before this. I loved the chimes! Thank you so much for teaching us the chimes. I have never been able to read music before you taught us how. It was kind of hard to play “Jesus Loves Me” with two chimes to handle, but I figured it out. I thank you a lot.